Cypress Creek is driven by the belief that solar makes our world cleaner and healthier. From development to construction to operations, we create projects that benefit communities for decades. Cypress Creek Renewables is a leader in utility and community scale solar, with more than 300 projects and 3.2 gigawatts of local solar facilities currently deployed across the US. 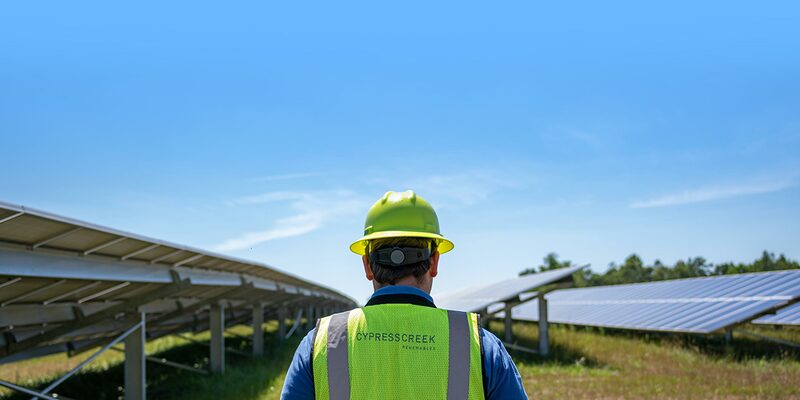 Led by an experienced executive team, Cypress Creek develops, finances, constructs and operates solar farms that provide communities with affordable energy, new revenue streams, and jobs. Our solar facilities are sited in states with proven or emerging markets for clean energy. We partner with landowners, communities, utility companies, development partners, and local vendors to site, develop, and underwrite projects through our in-house finance team and committed funding from our trusted investor network. Cypress Creek is committed to the communities we serve. Fostering initiatives including sponsoring workforce development programs and planting pollinator habitats at our solar projects, Cypress Creek strives to be a good neighbor and give back to the communities where our projects are located. As Cypress Creek grows, we seek creative problem-solvers, and courageous individuals looking to join our team. Our company welcomes and supports a diverse group of innovative thinkers from all backgrounds, upholding the fundamental belief that we are affecting change through our work.